It's Baby Zoe! And she's sitting on the Mountain Laurel Blanket I knit for her. 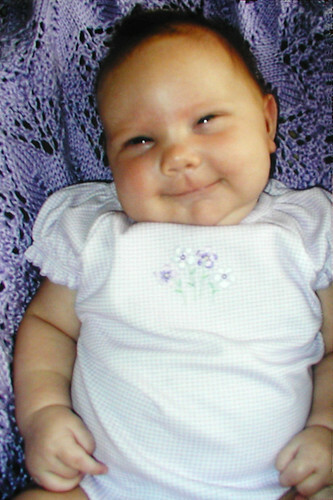 That's why she's smiling ;) I received this pic in the mail along with a Thank You card from my brother and SIL. I couldn't resist posting it. She's too damn cute! Anyways. This is just a quick update. I've finished my tank top and will post pictures this weekend, so check back. It turned out pretty good for my first self-designed-knitted-garment-thingy. 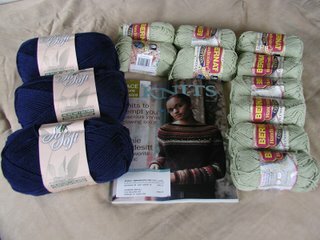 My yarn order from ebay came! 10 skeins of Handicrafter Cotton for $5 and 3 skeins of Bernat So Soft for $3. I already have a project in mind for cotton, which is why I bought it in the first place. But when I saw the other yarn for so cheap, I ordered that too. I mean why not? It's cheaper than Wal-mart (I realize this isn't the most fantastic yarn in the world, but :P). AND the Fall IK was in my mailbox waiting for me too. I've been oogling and reading since last evening. I like the Equinox sweater on the cover and Gatsby Girl. Don't miss Eunny Jang's article on lace shaping. I have that saved for tonight (a perfect way to spend a Friday evening). How nice to see the baby loves her blanket! The cotton color is really pretty too. I am just about to order a big haul on Smiley's yarn myself! She is just too precious and it looks like she just loves that blanket!